IDF: Transfers tons of humanitarian aid to Syria refugees on Israeli border, but bars refugees from entering Israel. The Israeli military made a large transfer of humanitarian aid to Syrian refugees gathering near the Israeli border overnight, following a series of airstrikes by the Syrian military which killed dozens of civilians in southern Syria. Roughly 120,000 Syrian civilians have been displaced following a military operation by the Assad regime in the Daraa region of southern Syria, the London-based Syrian Observatory for Human Rights said on Friday. Roughly half of those refugees are said to be making their way towards the Golan Heights, while the remaining 60,000 have clustered along the Jordanian border. Jordan, which accepted hundreds of thousands of refugees prior to 2014, has maintained a closed border with Syria for the past four years. On Tuesday, the Jordanian government said it would maintain the closed-border policy, and would not accept more refugees. 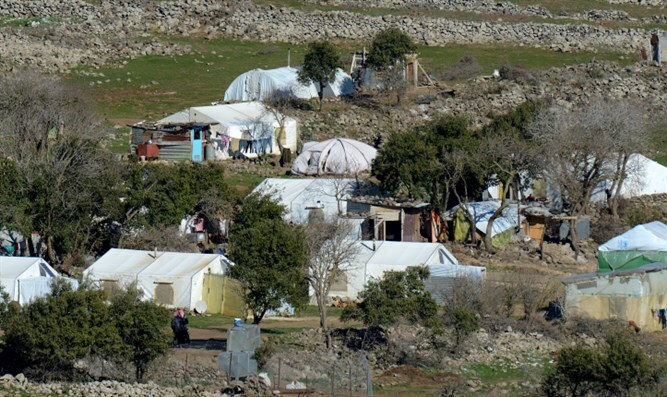 By Thursday night, thousands of Syrian civilians had reached the Syrian-held portions of the eastern Golan, and were setting up makeshift refugee camps along the Israeli border. While a senior Israeli official said Thursday evening that Israel would not accept Syrian refugees, the IDF did provide large quantities of food, medicine, and clothing to the refugees in a transfer overnight, an IDF spokesperson said Friday. “Last night, during a special operation simultaneously taking place in four locations, humanitarian aid was transferred to Syrians fleeing hostilities and living in tent camps throughout the Syrian Golan Heights,” the IDF said in a statement. While the Israeli military vowed to provide aid to refugees near the border, in the statement released Friday the IDF emphasized that it would not permit refugees to enter Israeli territory. Over the past few years, Israel has transferred food, medicine, and clothing to Syrian refugees near the Israeli border, and has brought thousands of wounded Syrians to Israeli hospitals for treatment.